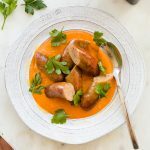 This Sausage and Romesco is Whole30, paleo, takes around 30-40 minutes to prepare and is dead-simple! Did I mention that everything gets cooked up in a single roasting pan? Always a bonus! In one fell swoop, this dish goes from quick-and-easy weeknight dinner to main course when entertaining. 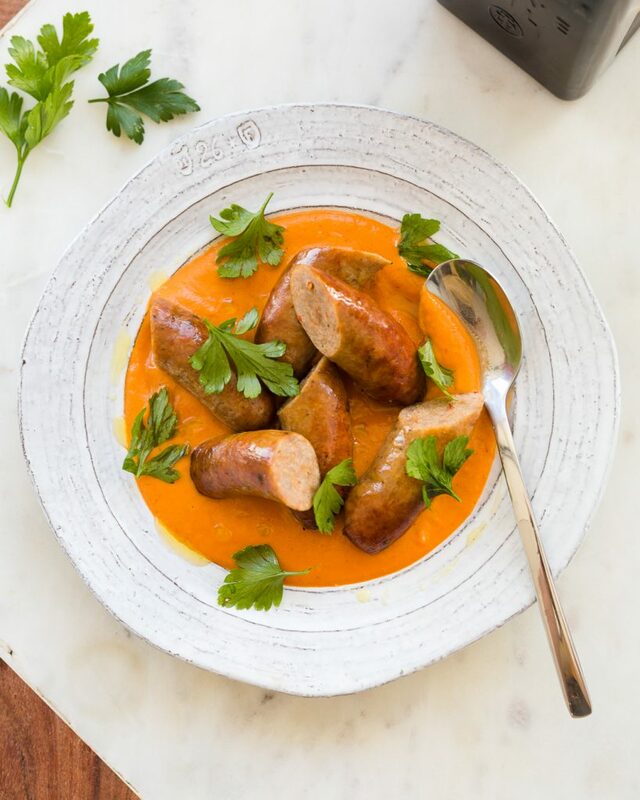 If so inclined, you can prepare the Romesco sauce separately ahead of time (reheat before serving) and simply grill or roast the sausages once guests or hungry children arrive. I’ve been secretly leaning on this recipe for the past few weeks now. Every time I made it I felt the urge to share what I was up to on my Instagram Stories but decided to wait until I had everything posted to the blog first. The sausages in this recipe are pretty straightforward and almost impossible to mess up. Just be sure to choose quality ones that are free of any junk or fillers. Personally, I’m a sucker for the hot Italian ones at Farm Boy or The Healthy Butcher. Also, try to look for sausages with casings that are intact on either side. A sausage with weak or open edges will lose its precious juices while cooking. 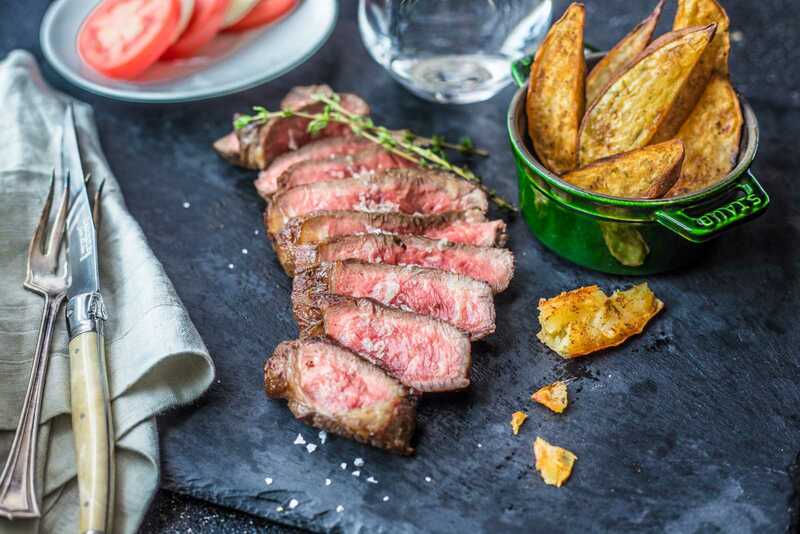 The real trick, however, is using a meat thermometer to know when they’re perfectly cooked. As always, I recommend this Lavatools Javelin digital meat thermometer. It’s the best bang for your buck and has served me very well over the years. You can get it on Amazon and it comes in a variety of colours. I think mine is Chipotle colour. I mean, what’s not to love?! The Romesco is the real star of the show here. 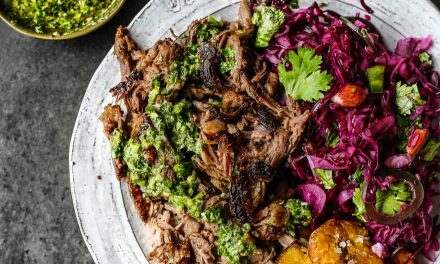 It’s super flavourful, incredibly quick and easy to make (especially if you’re in a pinch), and it’s made from only 6 readily available ingredients – 5 if you don’t count dried herbs. Despite its simplicity, it will impress and have family and guests asking for more. The only reason not to make this Romesco sauce is because you have leftovers in the fridge! Speaking of, the Romesco will keep for about 5 days in the fridge and tastes just as good cold! I may or may not eat it with a spoon when Catalina’s not watching. Actually, that’s a lie! I don’t really care if she’s watching. The romesco can also be frozen for up to 6 months. Simply store it in a sealable mason jar (with some head room to account for expanding frozen liquids) and allow to defrost at room temperature or in the fridge before serving. I don’t know about you but I’m itching for the moment red bell peppers go on sale so that I can make a giant batch of Romesco for the winter months. Because this recipe has so few ingredients, it’s important to use quality stuff. There’s really nothing to hide behind here. Take the time to find great sausages and equally good produce! Your hard work will be rewarded! Add red pepper, onion, garlic, and oregano to a roasting tray. Season with a pinch of salt and pepper and 2 tbsp EVOO. 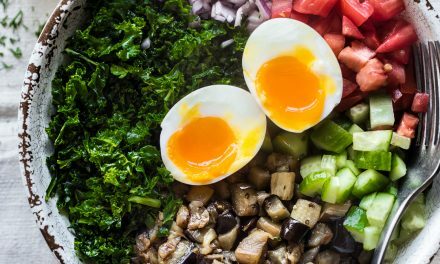 Toss everything to coat and spread vegetables evenly across the bottom of the tray. Place sausages directly overtop of vegetables. Brush the tops of the sausages with a bit of EVOO. Transfer to oven and roast 30-35 min (flip sausages halfway), or until sausages reach an internal temperature of 160F on an instant read thermometer. Remove roasting tray from oven. Set sausages aside and transfer all the vegetables and rendered juices to a high-speed blender along with 1 tbsp sherry vinegar. Blend on medium speed (if you have speed settings) until mixture is smooth and creamy. With the blender still running, slowly drizzle in 2 tbsp of EVOO (the goal is to achieve an emulsification). 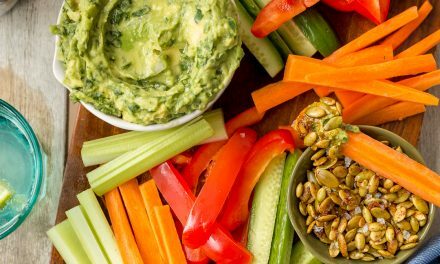 Turn blender off and taste Romesco for seasoning. Adjust as required. To plate, spoon Romesco onto a serving dish. 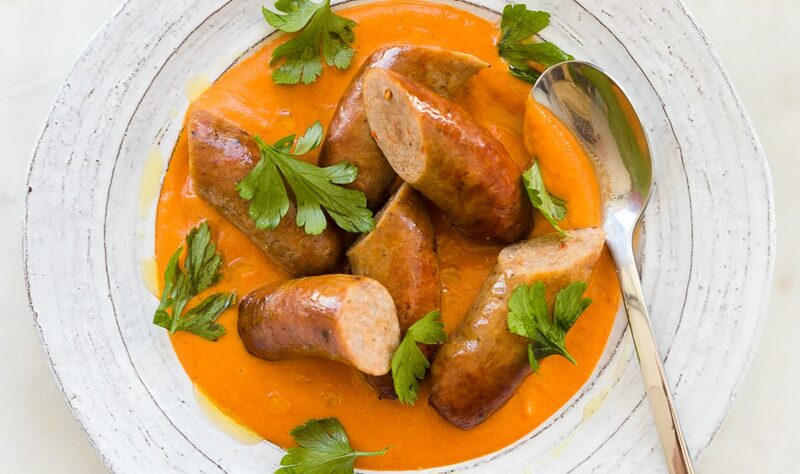 Slice sausages in half and arrange overtop of Romesco. Garnish with fresh parsley leaves and a drizzle of EVOO.